Matthew Wilson is honoured and excited to serve as one of DECA Ontario’s Chapter Development Officers for the 2018-2019 year. Matt is a grade 12 student currently pursuing the International Baccalaureate Diploma at Kingston CVI. Since grade 9, DECA has been a major part of Matt’s high school experience, recently completing a term as Vice President for his chapter. Matt believes that DECA is an incredible opportunity for many students that will not just be the best experience in their life, but the best experience for their life. Matt is heavily involved in a variety of activities both inside and outside of his school. At school, Matt is highly active with the math team, competing at provincial, national and international levels and helping train the newer members. Matt loves to help students realize their potential. He works with young kids at a local climbing gym to teach them the basics and strategies of rock climbing. Also, Matt is a member of the youth advisory council for his local MPP, Sophie Kiwala, where he outreaches with students and teaches the importance of civic duty. Since he was young, Matt has always loved to run; in high school, he has been a part of both the cross country and track & field teams, and for the past three years he has run with a competitive team. Matt enjoys spending his free time playing the piano, listening to music and travelling. 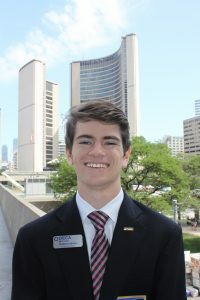 Matt is extremely excited to meet and connect with all of DECA Ontario’s members this year. He hopes to ensure that each student will find the resources, support and incredible opportunities to truly reach their potential and have an unforgettable year! He loves connecting with students from across Ontario and abroad, so if you have questions, ideas, recommendations or just want to talk about DECA, please don’t hesitate to contact him through social media or email at matthew@deca.ca.